Let me begin by telling you how much I appreciate your fine magazine. I am presently reading issue 127. I have a question, which I hope will not be interpreted as argumentative. My understanding of Christianity is that through the sovereign grace of God a man or woman is brought to repentance and faith in Christ Jesus, these graces flowing from the new birth that God brings by his Holy Spirit. That newborn believer in Jesus is from that moment fully and eternally in union with Christ. Out of that union then grows a life of faith and obedience. If I understand the mystic experiences of the Middle Ages correctly, their outlook seems to be the very reverse. . . . They launch themselves upon a quest for faith and obedience (a life of holiness) so that they can gain union with Christ. Thanks for reading and for writing. First of all, as a magazine we are committed—as our mission and faith statement says—to “seek to present the history of the global church and see the best in each Christian tradition.” We were also intrigued by the fact that Protestant thinkers like Martin Luther, John Calvin, John Wesley, John Newton, and C. S. Lewis all found the mystics valuable, even long after the Reformation. Second, there is ample evidence that those mystics we covered at length in the issue were seeking a deeper connection to the God they already knew by faith and would ultimately have attributed their spiritual growth in obedience to the sovereign grace of Christ. Finally, there wasn’t one single pre-Reformation school of thought; like many movements in church history, the mystics fall on a spectrum. So each one of them emphasized how faith worked out in practice differently—from the radical focus on Christ in Julian of Norwich to Meister Eckhart’s ideas of detachment from the world, which the church found to be a problem even in his own day. For more on this, we urge you to read our forum, “A church of the future?” on pp. 46–49 of this issue. Once again, CHI has prepared and delivered a superb issue (#128) on the life of George Müller. As always, this issue is informative and inspirational. I have largely known of Müller anecdotally. This goes far beyond that and demonstrates a true saint of God willing to “live on the edge,” armed with the promises of God, a fruitful prayer life and faith that challenges an otherwise anemic version of faith too often on display in many 21st century churches and denominations. It personally challenged me and my own weak faith and offers a rather simple yet profound solution: spend quality time in prayer and in the study of His Word. [Placing] this biographical sketch within the context of the Brethren tradition and the rise of Dispensationalism was a brilliant decision of your editors. But then, that has always been one of your strengths. . . . Thanks, Tom! We were challenged by Müller too. Do you cross the seas? We often get asked if we can send Christian History overseas. 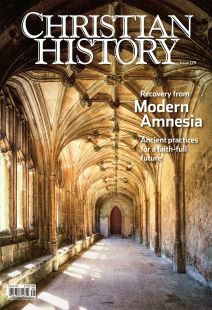 Christian History is a donation-based publication, and CHI is a registered 501c3 organization. Many in the United States and Canada actually receive the magazine for free if they are unable to make a donation. But due to the high cost of shipping overseas, we require a minimum $35 donation for all international subscriptions. Of course all of our issues are free to read online anywhere in the world with Internet access, with issues 100 and up—as well as a few selected classic issues—available in full color.